Loading funds onto your Biola ID Card enables you to access a variety of on-campus services ranging from retail purchases to printing, not to mention discounts on dining. It's a convenient alternative to carrying around cash or credit cards. Users can make real-time deposits online, save a preferred credit card* for quicker reloads, and set up recurring deposits. You may also view your current balance, transaction history, meal plan use, or freeze your ID card if it is misplaced. *Please note we do not accept American Express. All other major credit cards are accepted. Click on the appropriate account type to view a summary. Click ‘+Add Money’ to deposit additional funds. You can choose to add a specific amount or top-off your balance. Enter Credit Card payment info. You may choose to save this info for future use. The confirmation page allows you to specify where you would like your receipt e-mailed. Now that your eAccount has been set-up, you can download the Android app or iOS app to manage your funds on the go! NOTE: This is optional; you may continue to use the website to add funds. After you have downloaded and opened the app, select "Biola University"
We often have parents, grandparents, and friends asking how they can put money on a student's ID card. We've got that covered too! 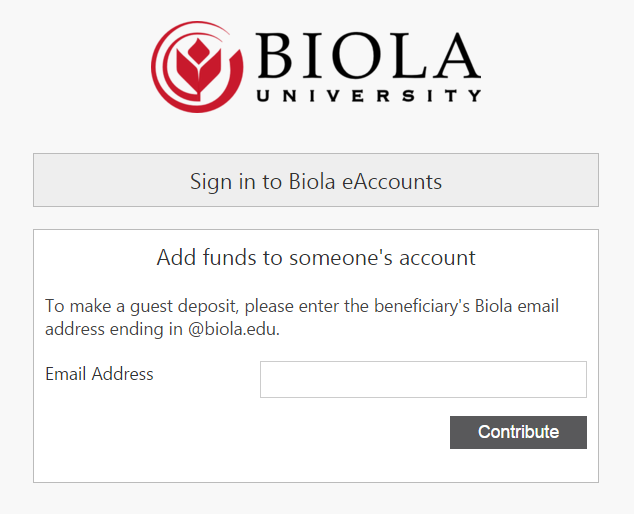 Simply head to the same website, biola.edu/eaccounts and click the button to 'Add funds to someone's account'. All you will need is the recipient's Biola e-mail address. You can even choose to have a confirmation e-mail sent to them so they know you've sent them a gift. Prefer to load your Biola ID card in person? Student dollars and Faculty/Staff dollars can also be purchased in-person with cash or credit card at the self-serve kiosks in the Library and at any of the Bon Appetit food service facilities.